Zeb and Zach Wahls created this illustrated playing card deck to celebrate inspirational young women. Siblings Zach and Zeb Wahls were inspired to start illustrating card decks when they heard the phrase, "playing the woman card." 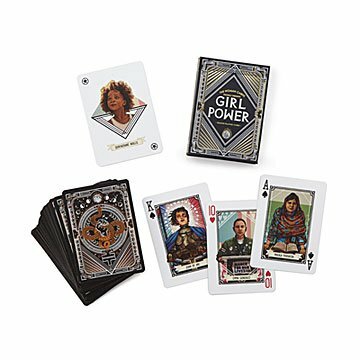 This fun, educational set actually features 52 "woman cards," and the ladies included all made history before adulthood. For example, each ace depicts activist Malala Yousafzai, while Mary Shelley, the first lady of science fiction, occupies the queen cards. The deck even includes two jokers, young actresses Quvenzhané Wallis and Shirley Temple. Give them to a kiddo as a playful learning tool—they can visit the link on the website included on the instructions card to learn more about each featured female—or pair with the brother-sister duo's original Woman Cards for a double dose of empowerment. Drawn in Iowa. Manufactured in Texas. Iowa City-based sister and brother Zeb and Zach Wahls are a pair of aces. Zeb, Art Director of the Woman Cards, was already a staff illustrator for the Daily Iowan while she was a fine art major at the University of Iowa. She spent about 20 hours apiece on these 15 striking portraits of American women who changed the world, including Eleanor Roosevelt, Sojourner Truth, Gertrude Stein, and more. Her brother Zach became a nationally known advocate for LGBT rights after giving a speech to the Iowa legislature on the subject in 2011. In 2012, he published a memoir, My Two Moms: Lessons of Love, Strength, and What Makes a Family, which became a New York Times bestseller. “Making these cards is an opportunity to pay homage to this incredible group of women who have accomplished so much," says Zach, "even when the deck was stacked against them—pun 100 percent intended—and also to create some incredible art."